Product prices and availability are accurate as of 2019-04-26 02:20:23 EDT and are subject to change. Any price and availability information displayed on http://www.amazon.com/ at the time of purchase will apply to the purchase of this product. Compact design and with a hook + Carabiner, easy to be held in hand or attach it to your backpack in camping. It's great for smokers. You do not have to carry around a lighter everywhere, or worry about losing your lighter again. It also can ignite paper or leaf, this would be useful. 2 USB outputs allow you to charge two devices at the same time, the solar power charger provides great convenience with you and your friends who needs charging services. 4 LED indicator lights that show at any time charging and discharging process. Avoid over-current, over-voltage, over-load and short circuit, etc. Water-resistant, dustproof and shock-resistant, wear-resistant. Long lifespan with more than 500 recharging times. Huge Capacity: Built-in rechargeable 15000mAh battery can charge iPhone 5S(4.3 times), iPhone 6/7(3.9 times), Galaxy S6(3 Times); ideal for hiking, camping trips or other outdoor activities. 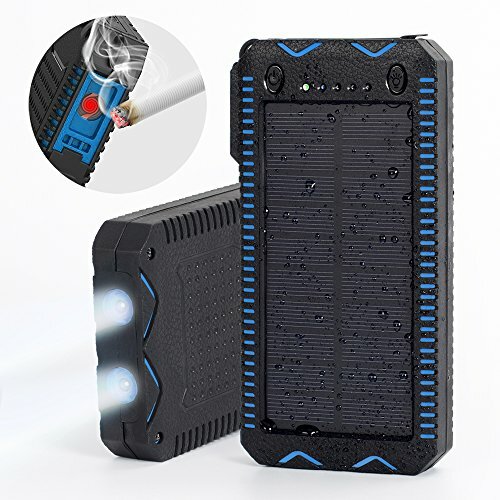 Multi Functional Solar Power Bank: Dual USB Charger Ports for charging two devices at the same time; Intelligent LED indicator can be used as Torch / SOS Flashlight under different modes. Built-in Cigarette Lighter function: It's great for smokers. The Cigarette Lighter can easily ignite a paper or leaf, and this would be useful in the field if you didn't have a lighter. Multiple Protection Design: The portable solar charger shell was made Solid and Sturdy Rain-splash & Shock-proof, wear-resistant, dust-proof, and metal hook for hands-free or hang it on backpack wherever you go. What You Get: Elzle 15000mAh Portable Solar Charger with Exquisite Packing, 1M Micro USB cable, User manual, Carabiner; 18-Months Warranty - Friendly Customer Service.